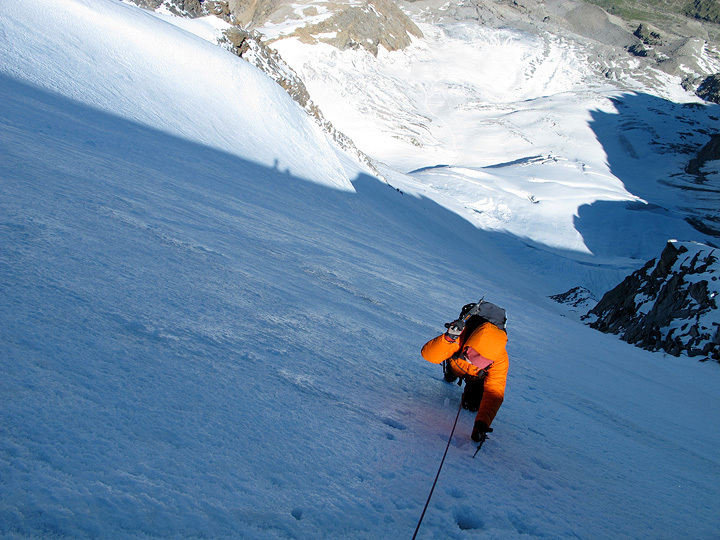 Norm Numerof, of the Colorado Numerof's, joined Mark for 7 days spread between France and Switzerland We were faced with a decidedly "variably" weather forecast, but managed to do some good climbing none-the-less. 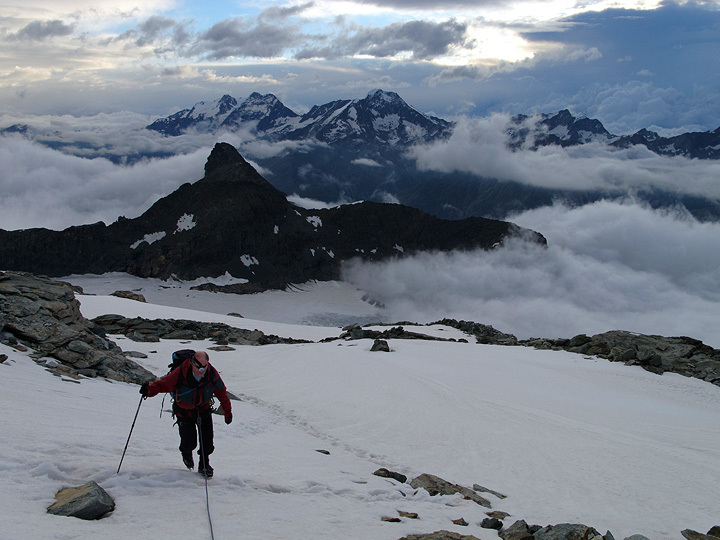 We began with a "warm-up" of Pointe Mourti, in the Valais. 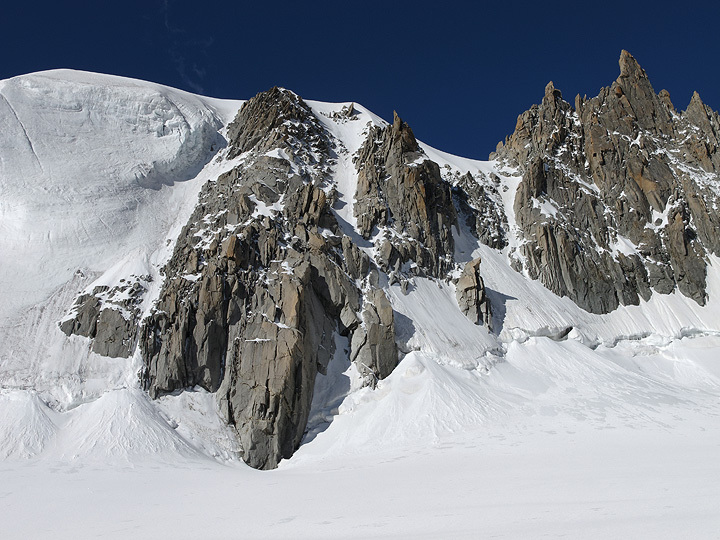 This photo taken from the Moiry hut, shows Pointe Mourti. Mouse over to see the route. 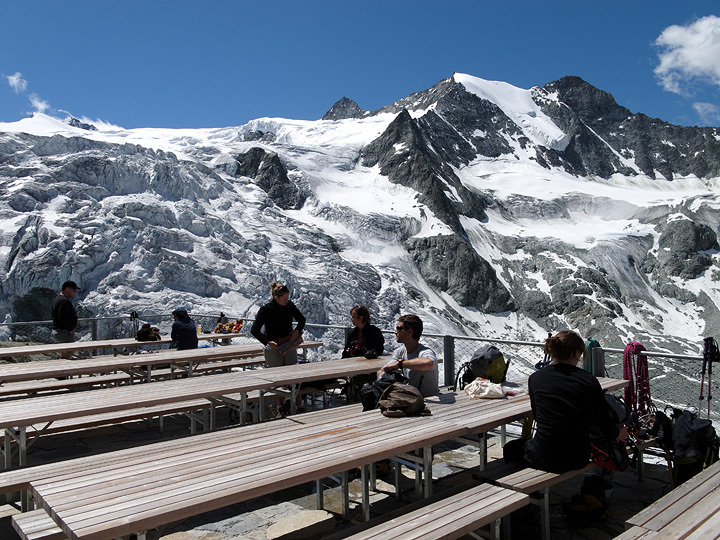 The Moiry hut was completely renovated about 2 years ago. 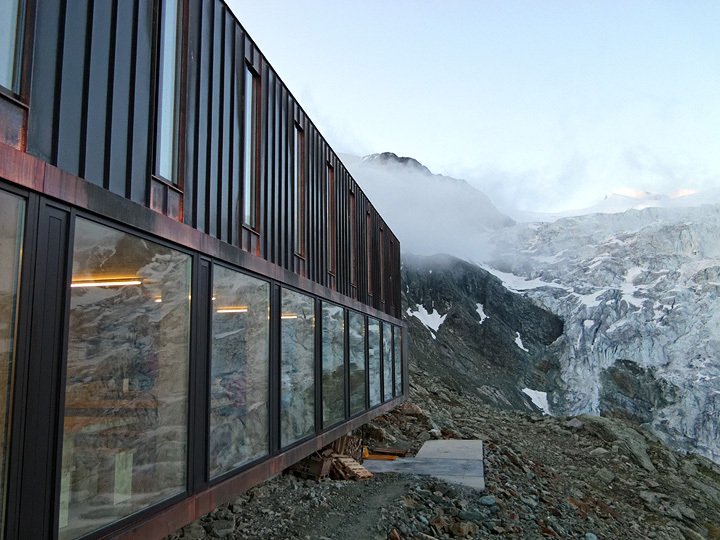 It now must rate is one of the best huts in Switzerland. You can now enjoy a hot shower before you come down to the dining room to gaze out the giant plate glass windows. 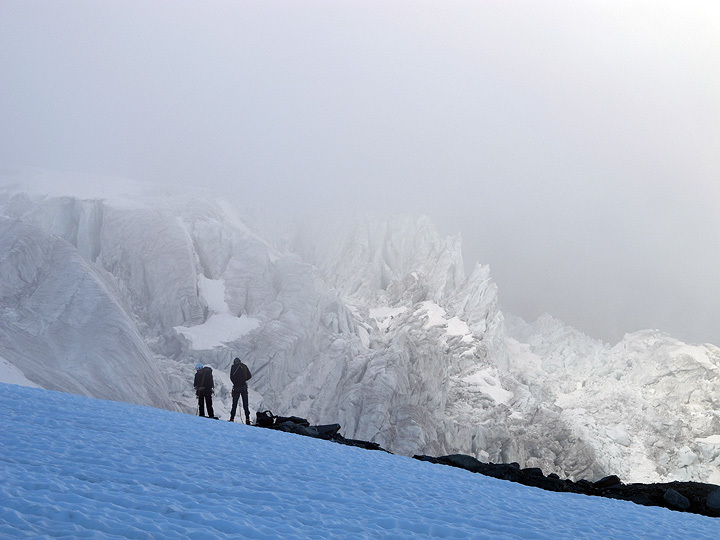 Starting off on a foggy morning, another team ropes up along side the glacier. 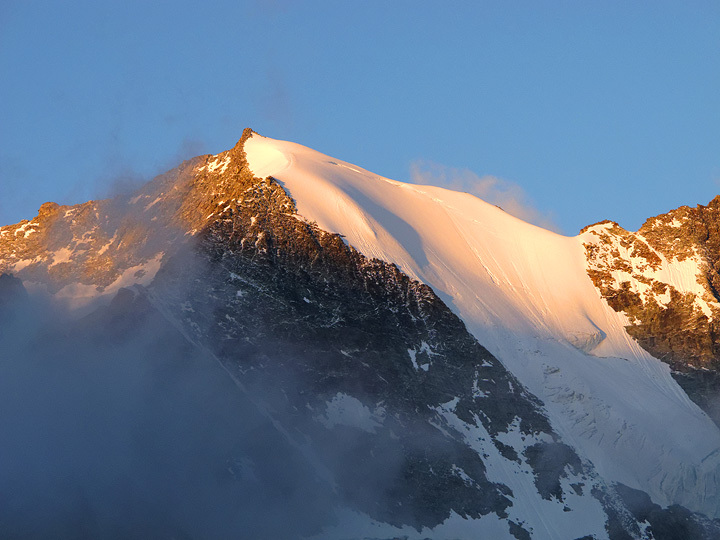 Pointe Mourti in the morning sunshine. 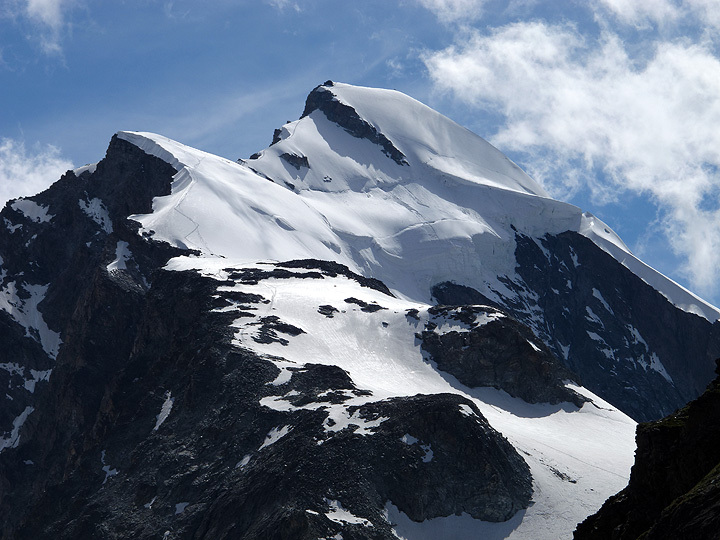 This is the final easy snow ridge to the summit. 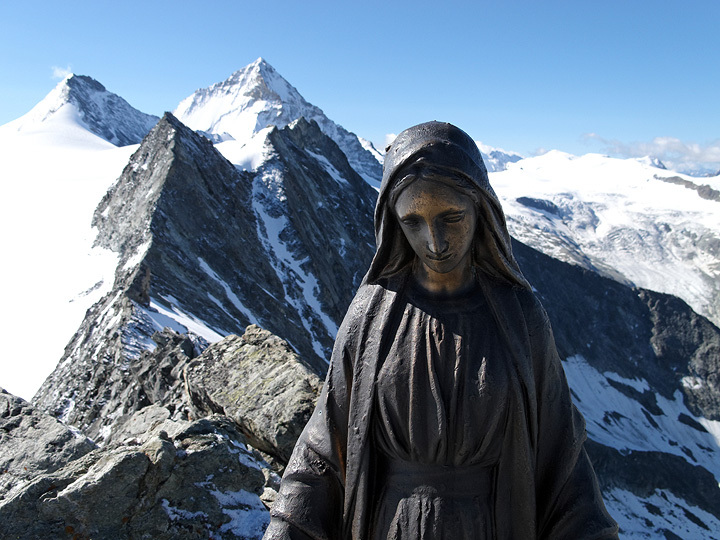 Madonna with the Grand Cornier and the dent Blanche behind. 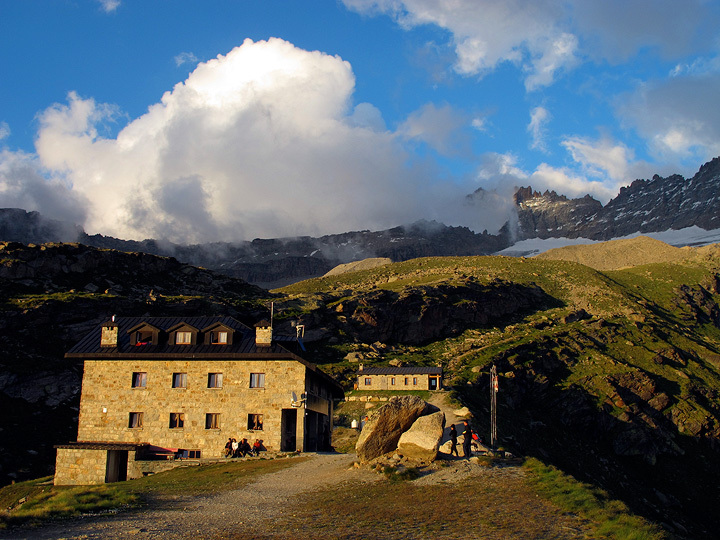 With an improving forecast, we then headed up to the Chabod hut on the Gran Paradiso. 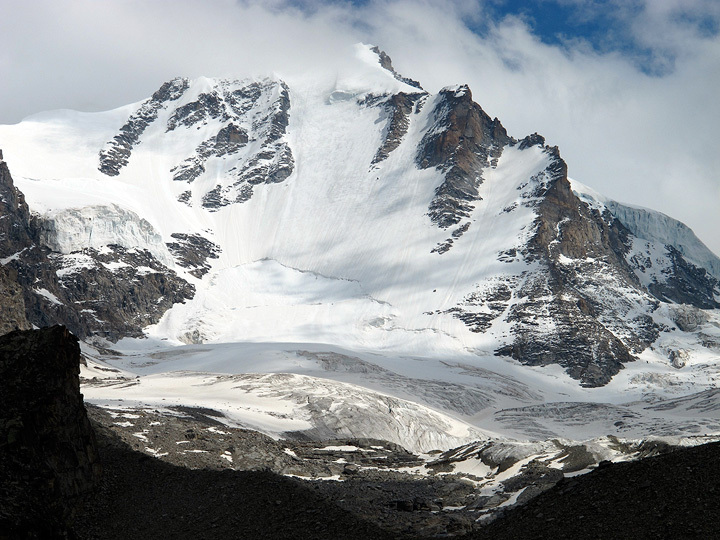 Our objective is the NW Face, a fine sheet of ice. Mouse over for the line. The Chabod hut in the evening light. 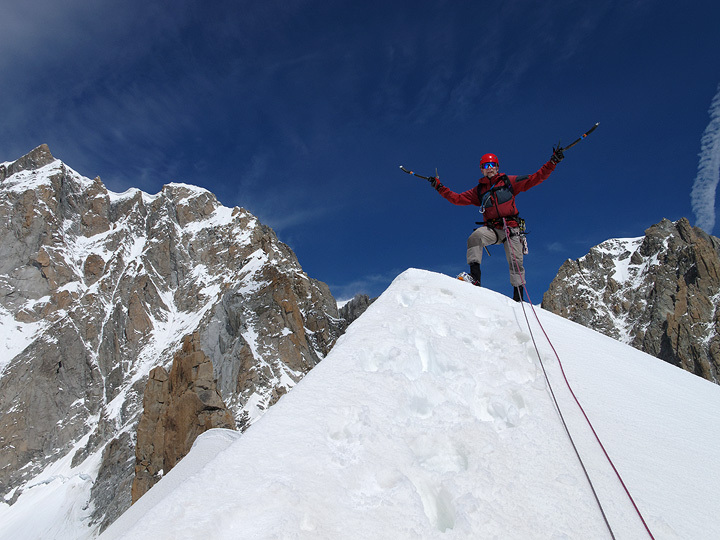 After some 10 pitches of calf-burning ice, we finally arrive in the sun on the summit ridge. A final pleasant stroll to the top. A perfect day. 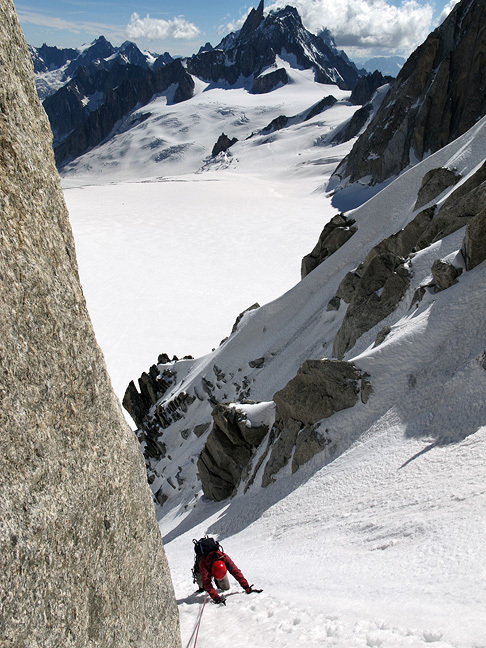 With only one day of reasonable weather in the forecast, we headed up into the Combe Maudit, to climb an ice route called Mitsunori Shigi. 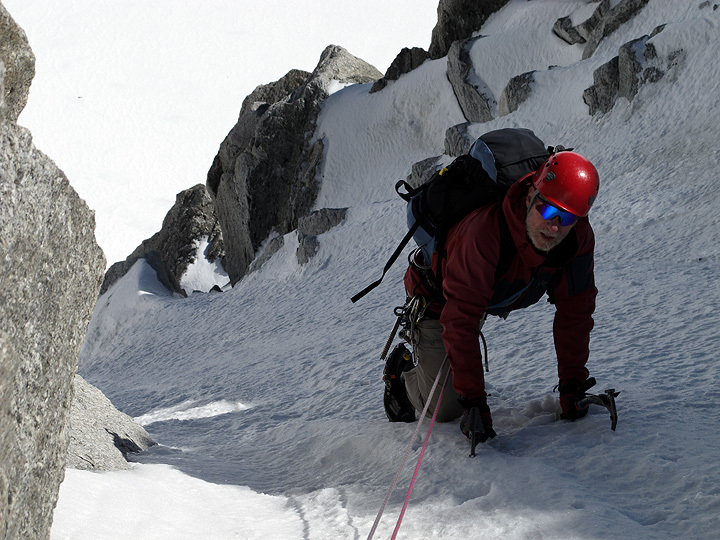 Some 5 or 6 pitches of fun ice up to about 65 degrees a the steepest. Mouse over for the route. 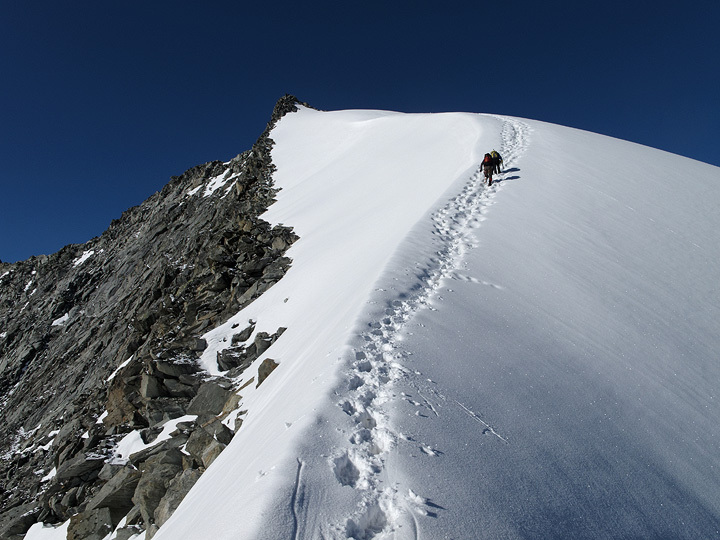 Approaching from Point Helbronner. Though the sky was blue, the wind was ferocious. Norm at the first belay. 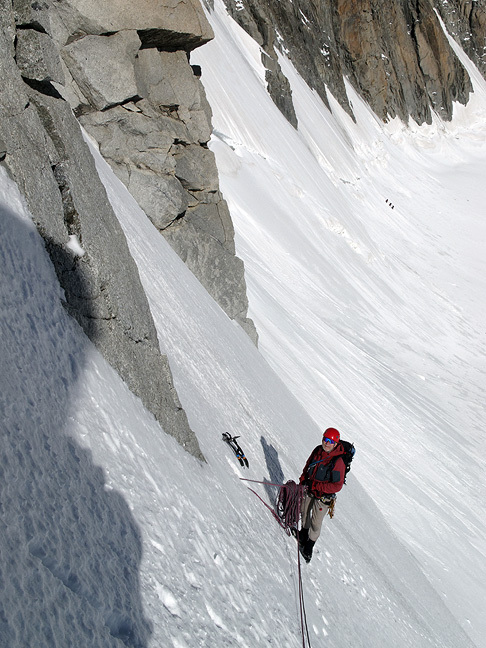 ...into the couloir, after the steep part. 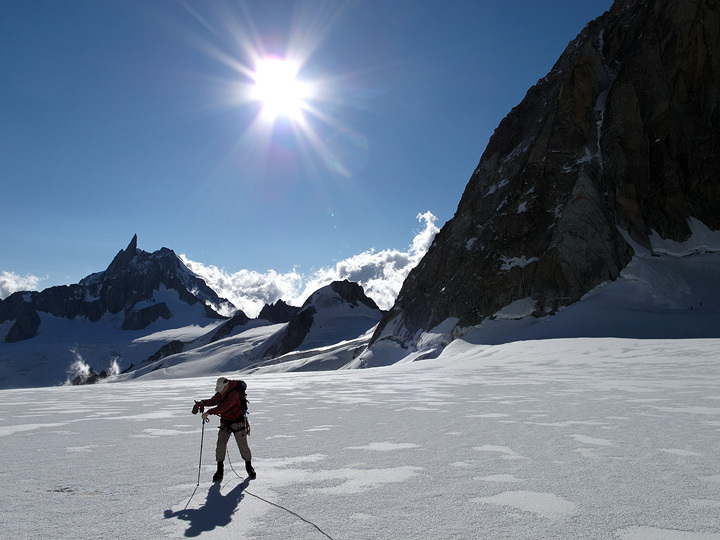 We climbed up into the sunshine, and some rather mushy snow. 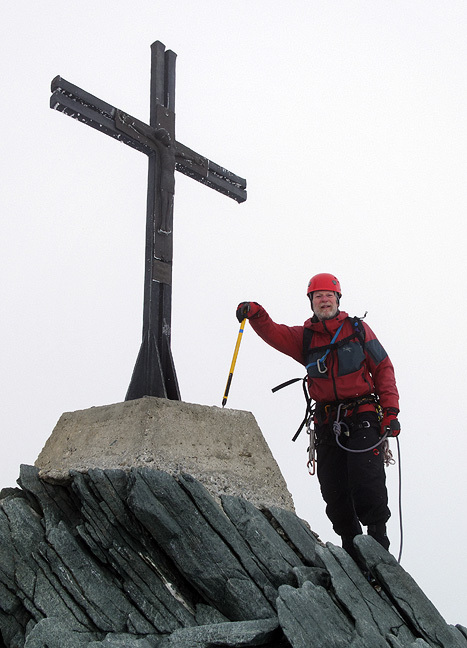 Norm on the summit of the Calotte de la Brenva, at the top of the route. We enjoyed an "interesting" descent. 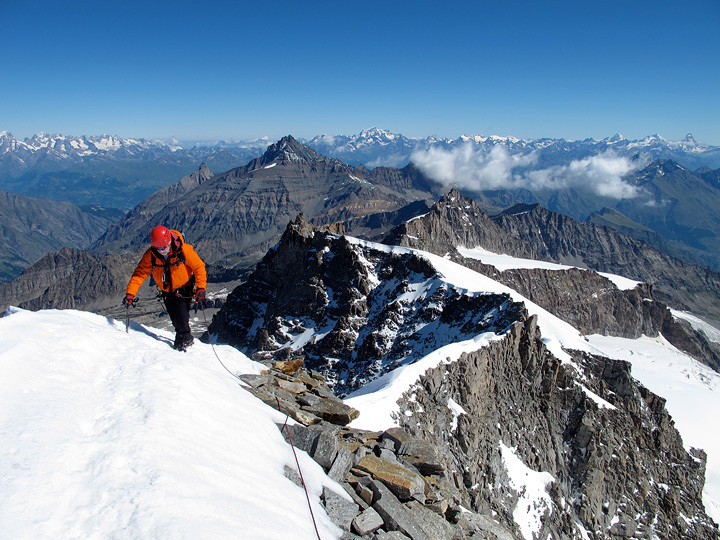 Last, with a deteriorating forecast, we decided to try to beat the weather on the Hohlaubgrat on the Allalinhorn. Mouse over for the route. 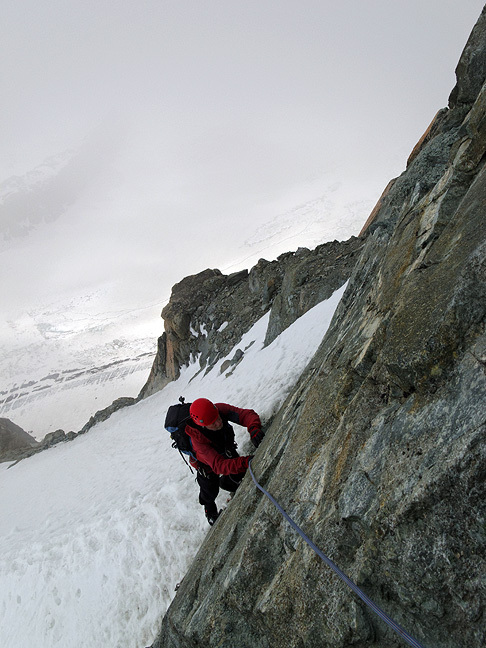 Starting early from the Britannnia hut, we had prefect climbing conditions among the arriving storm clouds. 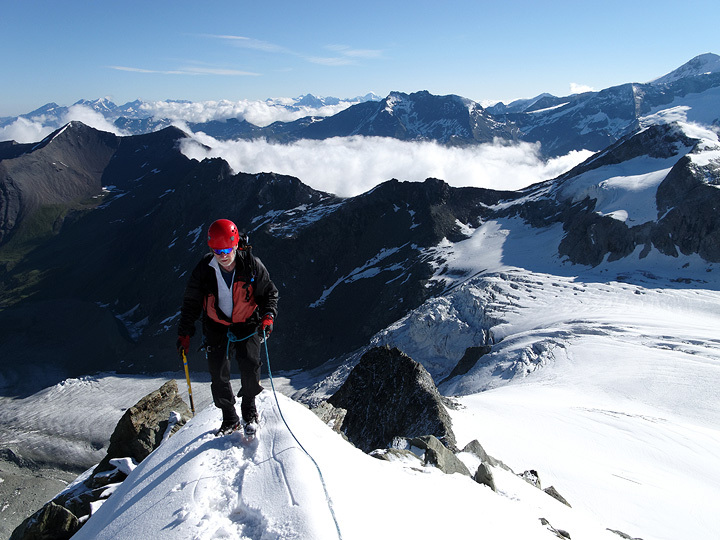 The start of the rock step on the Hohlaubgrat. Norm on the summit engulfed in cloud.